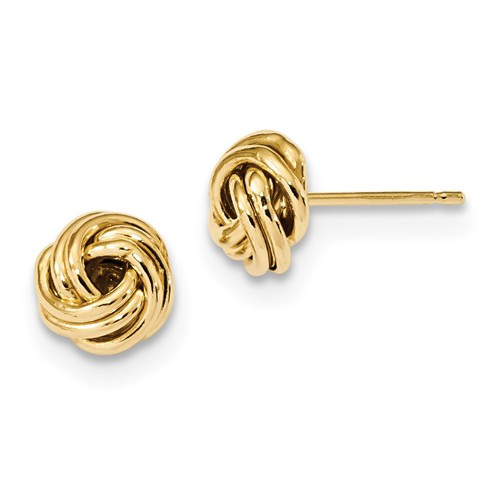 Love knots have been associated with friendship and loyalty for centuries, and these beautiful 14K yellow gold love knot earrings are the perfect way to celebrate your feelings! These 14K yellow gold earrings feature an attached post with a push back closure, and are made of a smooth looking yellow gold. The love knot part of the earrings themselves each measure 9mm in size, making them ideal for daily wear or special occasions. These sweet earrings feature your favorite traditional love knot design! We guarantee our 14K Yellow Gold Love Knot Earrings to be high quality, authentic jewelry, as described above.